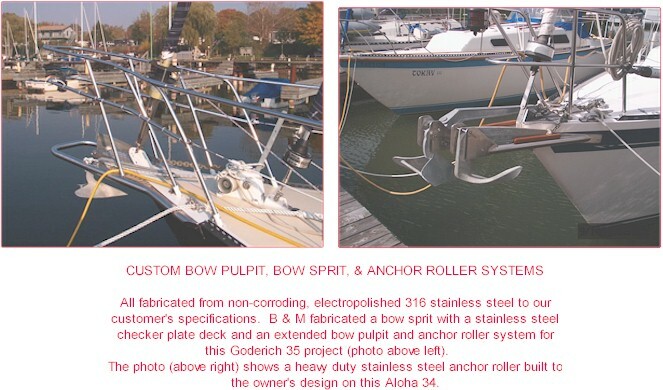 Bow pulpits, bow sprits, & anchor roller systems are built to your design to meet your boating needs. Your choice of tube sizing. 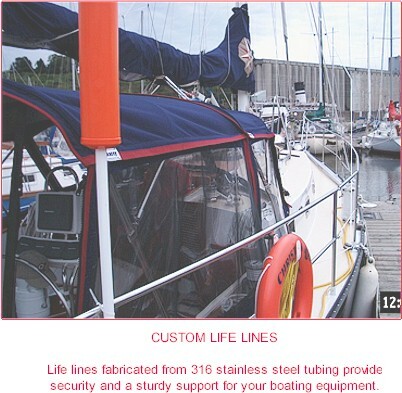 316 stainless steel tube lifelines will keep your boat's crew on board and are stronger and safer than wire. 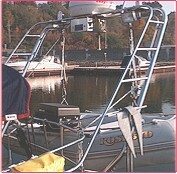 Our lifeline systems including stanchions, can be installed on your boat utilizing your existing bases. All orders fabricated in sections for self installation. Keep your crew safe by extending your existing stern pulpit around your entire cockpit. It also provides additional mounting area for your safety equipment and gear - life ring, man-over-board pole, stern anchor, barbeque etc. We also extend pulpits aft to provide additional seating. Cockpit enclosure and cushions on this project were manufactured by Genco. A custom equipment arch is shown in this photo. 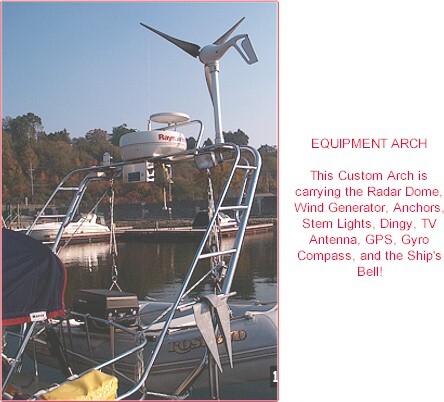 Our arches are designed to carry all your instrument requirements including radar, GPS, gyrocompass, satelite telephone, radio & television antennae and your heavier gear including dinghy, wind generator, and stern anchors. Enhance your pleasure and investment with maintenance free stainless steel. 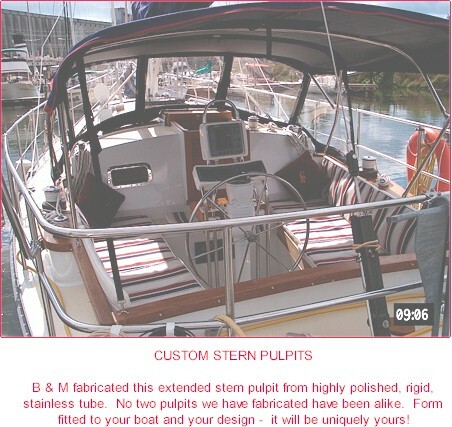 We fabricate mast pulpits, dorade vent guards, instrument mounts, pedestal guards, and cabin top handrails. All products come with instructions for self installation. Fuel, water, and waste tanks in mild steel, stainless steel, and aluminum. Send us a sketch, template, or your old (empty and cleaned) tank for a quotation. All tanks are fully welded, come complete with baffles, and a minimum of one inspection port (dependent on size). Each tank is quality inspected and thoroughly pressure tested before shipping. 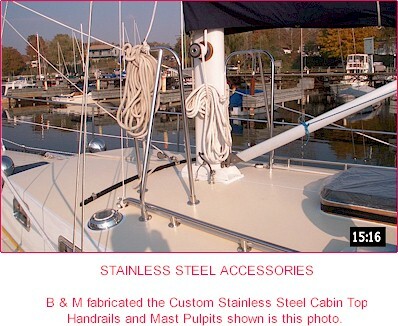 B & M boat cradles and stands are custom built to fit your boat. Fabricated in heavy gauge mild steel tubing. 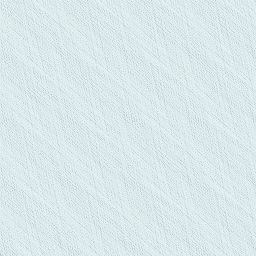 Painted in your choice of colour. All cradles and stands come with adjustable pads. Custom built, aluminum boat trailers for boats up to 25 feet in length. Trailers available with single or double axles.